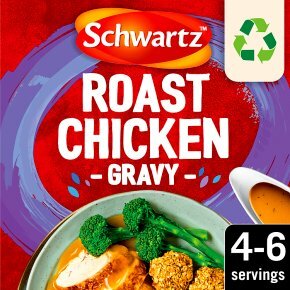 A tasty gravy mix with roast chicken flavour, sweet onion, aromatic sage and parsley for a rich and smooth gravy. With a hint of sage. Ready in 5 minutes. For perfectly smooth gravy just add 300ml water. No hydrogenated fat. No added preservatives or MSG. For our recipe you will need. 300ml (1/2 pint) water Directions... 1. Mix the sachet contents with the water in a small saucepan. 2. Bring to the boil gently, stirring continuously. Simmer for 1-2 minutes, until the gravy is rich and smooth. For a little inspiration... Delicious with roast chicken, stuffing, potatoes and vegetables. Replace a little of the water with the juices from your roast chicken and add a splash of white wine for a richer flavour. Microwave (800W)... Microwave ovens vary. The following is a guide only. Empty the sachet contents into a large microwaveable bowl or jug. Mix in the water and heat on full power for 4 minutes, stirring every minute until rich and smooth. Stir well and ensure piping hot before serving.